I found some nice stuff on Thursday, and also saved something toxic from making it to the landfill. In one of those bags was a little jar of mercury! Judging by its label I’d guess it was made in the 40s. The listed weight is one pound, but it’s around half full (weighs about 240 grams according to its scale, and presumably about 30 grams of that is the jar). Regardless, for its size the jar is quite heavy, and it’s interesting to feel how it sloshes around in there. 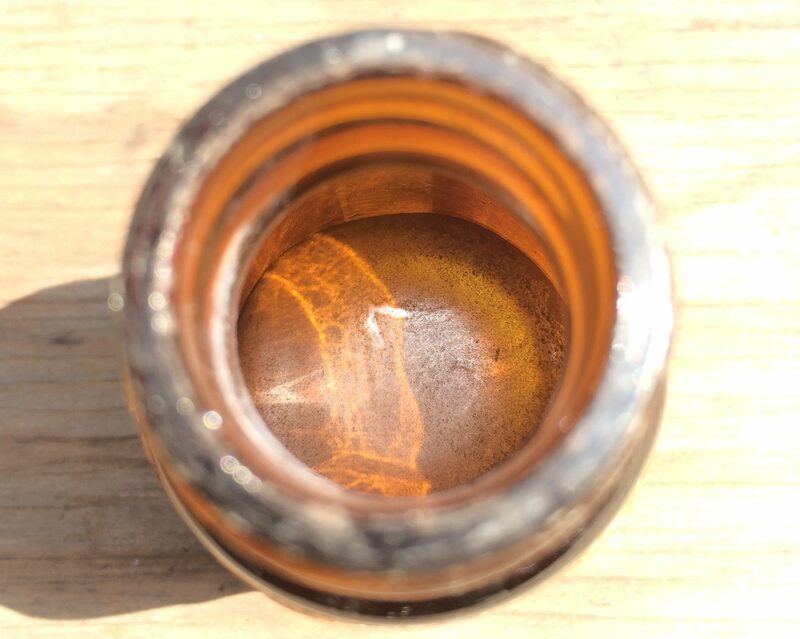 From what I can tell mercury is safe enough in this form, ie: in a glass bottle at room temperature. It’s even relatively safe to play with it in your hands – my friend’s mom apparently used to break thermometers and play with the mercury, and I also read some accounts of students touching it as part of a high school science class. However, it is still quite toxic, especially if inhaled. It’s especially bad for the environment, particularly in the food chain. Seafood is particularly vulnerable to mercury, and through biomagnification it can affect larger animals (like us) as well. So, it’s good that I saved this from going to the dump! It’s also probably good that it didn’t get crushed by the garbage truck, as the mercury in theory could vaporize and end up in the face of the garbage collectors. I’m guessing whoever tossed it wasn’t paying attention to what they were throwing out, or didn’t know just how toxic mercury can be. This is the first time I find a significant amount of mercury. 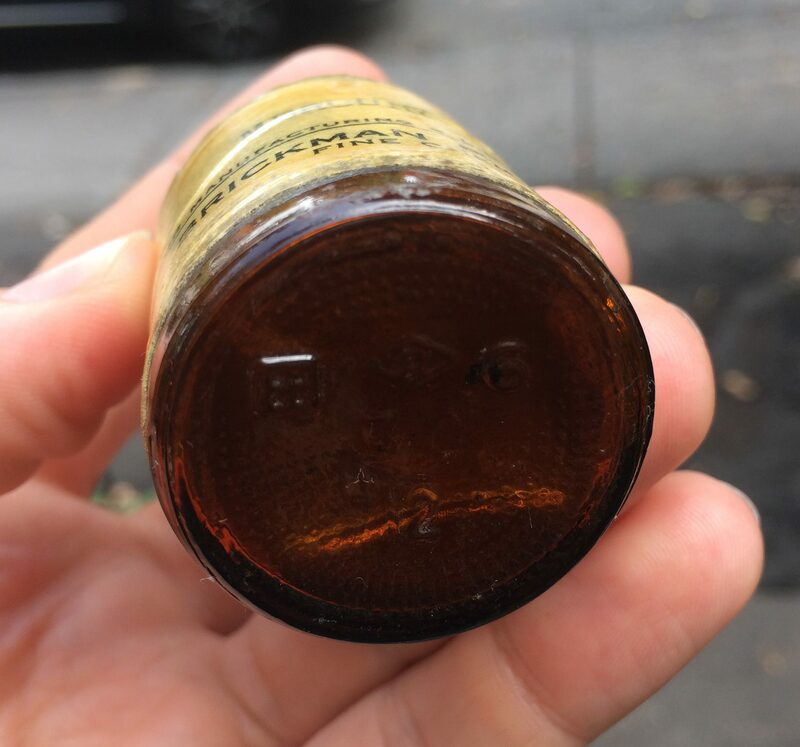 I’ve seen a few old mercury thermometers before, but those apparently contain only up to around 2.5 grams. Finding this makes me wonder if there are any other toxic elements collecting dust in people’s basements. Maybe someone has a jar of cadmium, arsenic, or radium kicking around. Fortunately, I also found some stuff here that I can use or sell. I found a couple little plastic containers, once of which held a small collection of Wade figurines. They’re not worth much, probably around 3$ a piece, but it’s definitely better than nothing. I saved plenty of neat old junk, including two card games from Canada’s centennial (1967), a couple pairs of cool no-name frames, and two rolls of veneer. Sorry these photos aren’t as good as they are usually, I’m still figuring out how to take photos at my new garage space. The lighting definitely isn’t as ideal as it is in my light box, but it’s better for taking larger group shots (which saves me a lot of time, and generally makes it easier to share extra finds). 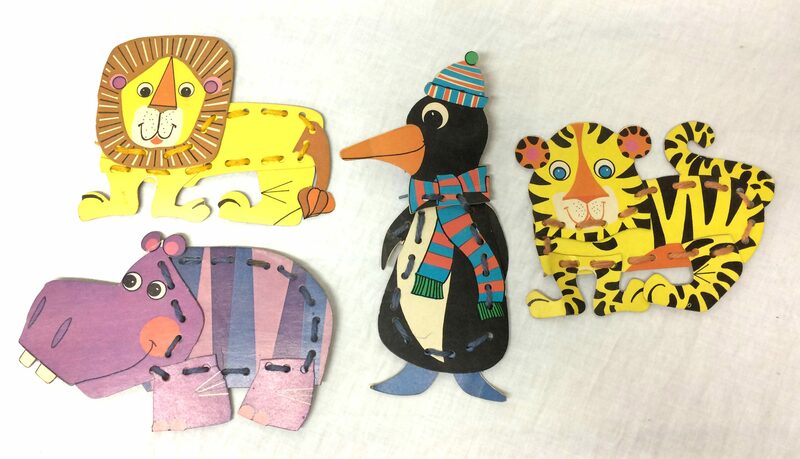 Here’s a couple of cute strung together cardboard animal figures. I’d guess they’re from the 60s or 70s. The jigsaw was a nice find. It’s old and a bit dirty, but still seems to work great. My friend will likely make use of it in some future woodworking project. Otherwise, I saved some leather scraps, powder paints, and some vintage watercolour paints. I’m not sure if any of the paints are still good, but I figured I’d give them a chance. I’ll definitely be returning to this house this week. 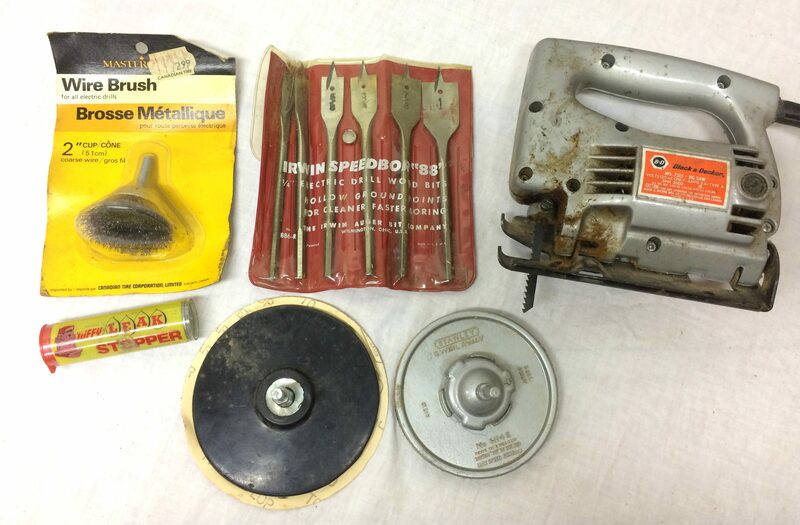 Hopefully I find more old junk, and less mercury. I’ve been having a lot of luck lately in my garbage runs. In fact, I have a backlog of photos on my computer waiting to be shared. I’m sure I’ll have another post up by the end of the week! Thank you for saving that Mercury from the landfill!!!!! Wow. Your posts constantly amaze me. I can’t believe people throw this stuff away. I used to have the beaver, cat and hedgehog Wade figurines … but they’ve gone the way of the dinosaur. They’re sweet little collectables for people who don’t have a lot of space. Yup, it might have been paint as well. The Wade figurines are pretty cute, they look good on a windowsill. 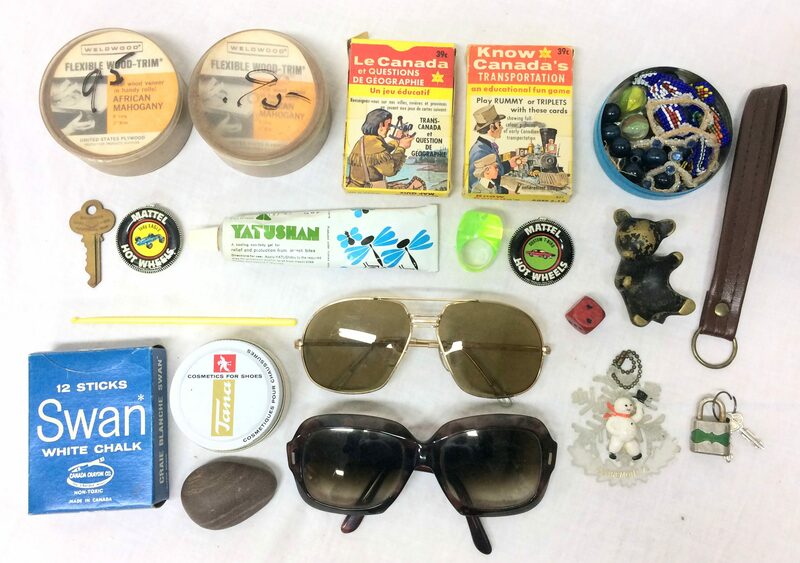 The two Bonhomme Carnaval, one in the plastic box and the other one beside the sunglasses, are collectable items. Thanks for spotting the Mercury jar. How will you dispose of it? Thanks. I’m not sure yet. There are lots of hazardous waste disposal options it seems, but it could also look nice on a secure shelf. Given the age of the bottle that could be a good option as well, as long as it isn’t in the dump! My husband had a jar of mercury. He donated it to a college chemistry professor. Thanks for your blog, I enjoy it a lot. I think I found one of those plastic mazes a while back actually. It was pretty cool! I doubt it was harmful at all. I do hope to write a book one day, once I have enough material. Glad you like the blog! The Wade figurines are from Red Rose tea. Would you be willing to sell the Wade figurines, and ship to the US? I am very interested in them. That looks like a Walter Bosse figure in the photo – the bear. Could be a Bosse “style”. Any markings? Hmmm you might be right about that, good catch. I’ll check it next time I’m at my storage. Dentists used to use mercury in silver fillings. 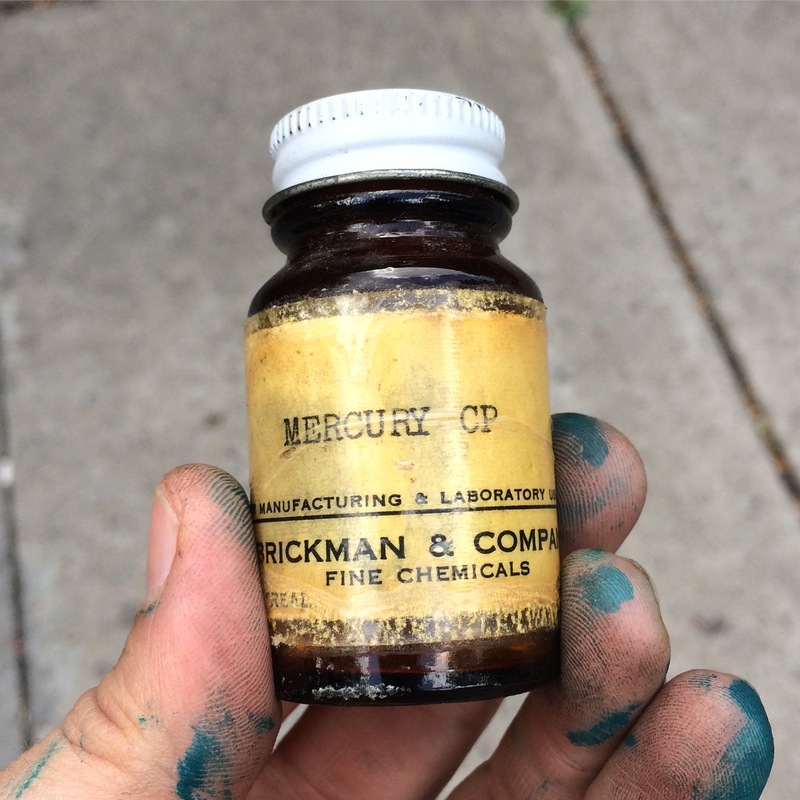 When we were kids and had to have a filling our dentist would give us a bit of mercury in a small vial to take home and play with. It was fun to divide it in little bits and watch it go back together in one piece. My great aunt lived in a tower block in Lancaster overlooking the River Lune. When we visited her she usually had a gift for us, usually a hand made teddy bear. Other times we were allowed to pick a figurine from her china cabinet. I have a giraffe and a corgi. We were shown mercury at school. Everyone had to take off any rings before the petri dish was passed around. What will you do with it? The physics department at the University of Liverpool were asked to help dispose of a cylinder of gas. It had some radium in the bottom to help keep the supply of radon. It was used to make medicinal fizzy drinks. Who knows what else you might find! When I was in grammar school in NJ back in the 1960s we used to play with mercury! The teacher would actually let us roll it around in our bare hands and shine pennies by immersing them in a droplet of the stuff. So far I suffered no ill effects (that I know of) from playing with this element, but my – how times have changed. Love your posts and the suggestion that you could write a book about your finds. I’ve heard of families having to move out of their house for a very expensive cleanup after a child spills mercury. Thank you for being alert to the hazard. Like DebraS, we were allowed to play with mercury in our school in Lachine. Pennies and dimes would gleam when coated with it, but the next day they would be badly tarnished. That was just one of the dangerous substance available in our chem lab — sodium, potassium, gasoline, various acids of course. And probably many others I can’t remember. They were all in locked cabinets, but the locks were not hard to defeat and the teachers were very trusting. It’s a wonder some of us are still alive. Your blog is inspiring! I just started doing this and plan on doing more!